Kristi and I have been married for more than three-and-a-half years, and while many parts of our lives are completely merged, there are also areas where our identities and roles have remained quite distinct. For example, she’s been the dancer and I’ve been the pilot. We both brought those avocations in from our pre-wedding days. Oh, I’ll step into her world for a spell or she into mine, but for the most part my domain is up in the clouds and hers has been on the parquet. It’s not that I don’t enjoy the challenge and artistry of competitive ballroom dance, but rather that I defer to her established history, training, and experience in this very demanding sport. In other words, she is the expert (and true talent, I might add!). When we’re aloft, the opposite tends to be true. Nothing earth-shattering so far, right? 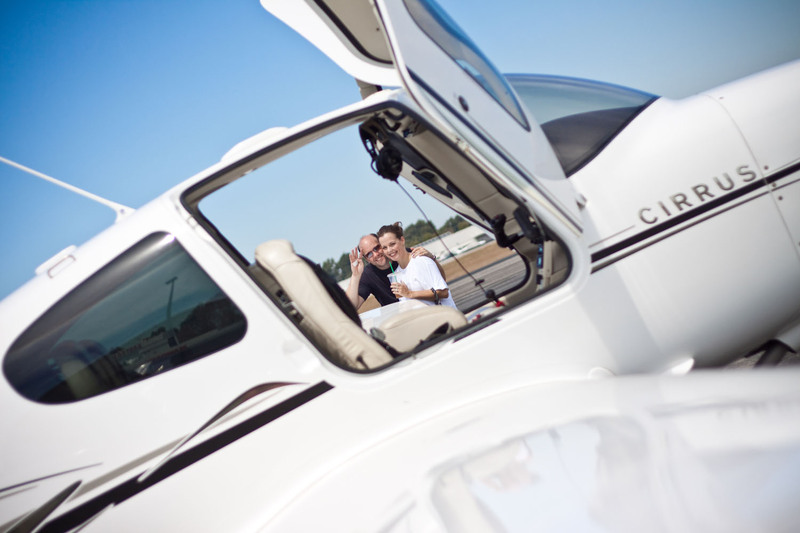 Getting ready to depart for Catalina in a Cirrus SR22 to re-create our first date. But lately Kristi has been doing some of the stick-and-rudder work on our flights on her own initiative. She seems to have enjoyed it, to the point that she’s showing an interest in possibly learning on a more formal basis, and that’s got me noodling about whether I should be the one doing the teaching. There are plenty of arguments both for and against the do-it-yourself approach. Let’s start with the money. Flying is expensive, and the fact that I’m an instructor means that we could get her trained at lower cost. She’s a quick study, but due to the airspace and complexities of operating here in Southern California, let’s assume it takes 55 hours of actual flying and another 40 of otherwise chargeable ground time. That’s 95 hours at, say, $65/hour. The savings: over $6,000. This is not pocket change! It’d also be convenient from a scheduling perspective if I were her instructor. And it’s an enjoyable avocation that we could share. Learning to fly is a momentous time for the student — I’d hate to miss being there for the big breakthroughs and milestones that one often encounters during the journey, not to mention shepherding her through the inevitable plateaus and frustrations that are, unfortunately, also part of the experience. A hot wife who likes to fly? How did I get so lucky?? One of the great challenges for any instructor is figuring out how a student learns. You’d think it’d be easy to teach everybody the same stuff in the same way, but this is not a traditional classroom activity. It’s a one-on-one learning environment, and every individual proceeds at a different pace and encounters their own unique hurdles. For example, an aeronautical engineer might be someone I could speak “the language” to right off the bat, whereas someone who never finished high school might need to be taught remedial math or physics. As Kristi’s husband, I might have an advantage in knowing how to best approach specific subjects. Finally, there’s an old saying: “if you want something done right, do it yourself”, and where my wife is concerned, I’d want to ensure nothing was overlooked or left to chance. And not just for safety reasons, although that’s certainly paramount. The dropout rate for student pilots is around 80%, and while most of that is undoubtedly due to financial concerns, it’s no secret that plenty of students are lost to scheduling difficulties, personality conflict, instructor apathy, or simply not having enough fun. When put into that context, the $6,000 suddenly seems a lot less important, doesn’t it? I’ve always thought this looked like an ad for a headset or sunglasses company. She makes a good argument, no doubt about it. There are times a CFI has to lay down the law on their padawan, and it’s easier to do that when the interpersonal relationship between the two is limited to student and instructor. Adding “husband” and “wife” can easily complicate things. Issues that are exclusive of aviation can find their way into the cockpit almost unbeknownst to either party. Teaching Kristi to fly would also mean that I wouldn’t be fully available to her as a sounding board when she had frustrations or doubts about either her performance or that of her instructor. Being that “shoulder to lean on” can be awfully important. If either one of us ever changed our minds about the wisdom of teaching a spouse, making a break that wouldn’t hurt the other person’s feelings might be difficult. On the other hand, the guy Lane interviewed for her Flying article did successfully teach his wife to fly and they seem to be better for the experience. But then, perhaps that’s what made it so noteworthy. I know quite a few people who met their significant other through aviation, but in cases where one taught the other to fly, every single one of them had the student/instructor relationship before they got involved on a personal level. That’s probably why this feels like uncharted territory. Having a little fun at the Catalina Airport. As I recall, we were sharing a cool popsicle on a very hot summer day. On the other hand, it seems quite common for a parent to teach a child or grandchild to fly. Again, this likely has to do with the nature of the relationship. The parent is already an authority figure over any younger member of the family, whereas with spouses it’s more of a — if you’ll pardon the pun — marriage of equals. There’s one more potentially detrimental aspect to providing flight instruction to a member of the family: the temptation to interact with the student in a less than professional manner. Or perhaps I should say, to let some of the professional decorum that normally accompanies one’s interactions with a client fall by the wayside. I doubt this would ever be done out of intentional disrespect, but it’s an insidious tendency that I’ve personally witnessed with other instructors who have taught loved ones to fly. For example, under normal circumstances a CFI wouldn’t (or shouldn’t!) dream of showing up late, canceling on short notice, taking phone calls during a scheduled lesson, or treating a student with anything less than the utmost professionalism and high quality service. But if that student was a family member, the lack of formality in their everyday relationship might make its way into other aspects of the training. That would be a huge mistake. An instructor needs to hold their student accountable for completing homework, assigned reading, and so on. Likewise, the student should expect that their instructor will be as timely, prepared, and professional with them as they would be with any third-party customer. The start of Kristi’s training is not imminent, so we’ve got plenty of time to figure this out. At the moment, my inclination is to teach her myself, but with a clear understanding that if we encounter problems or it doesn’t seem to be working out, either one of us can suggest switching to a third-party instructor before any unpleasantness destroys her enthusiasm for flying. So often in this business, we forget that taking wing is supposed to be fun! If it’s not… well, then it’s time to take stock and figure out what’s wrong. Another option might be to continue what we’ve already started: a slower, more informal training regime where a lesson is incorporated with our occasional travel by air. Her progress would be glacial in comparison to traditional methods, but it would have some advantages, too. Lower cost (we’d be flying for some other purpose anyway), less stress, and no pressure to “get it done”. This method might also preserve a lot of the fun since we’d rarely be droning around some practice area. If Kristi ever felt the desire to make faster progress toward solo or a private certificate, we could transition her into a formalized program. How about you, dear readers? Have you ever taught a spouse to fly, or learned from one? Do you know anyone who has? I’d be interested in hearing your stories and opinions. One thing’s for sure: whether I’m the instructor or not, Kristi learning to fly would be quite an adventure for both of us! I learned to fly at my husbands urging. After I started lessons in 1989 I never looked back – got a few more ratings and became his company pilot. He told me he was very proud that he could now insure his fleet because he had never been licensed himself. Old timers learned by doing! Great story Ron! I’m insanely jealous because my beautiful wife won’t even approach an airplane, much less entertain the notion of learning to fly one – you are a lucky man indeed! As for the subject at hand, I actually taught my dad to fly, at least up beyond solo where medical issues grounded him prior to getting his actual license. We both have an easy going personality and assumed our appropriate roles when instruction was underway. I think this is key. You correctly point out that it is easy to dismiss professionalism due to the relationship, which can be disastrous. I think you have the right approach to let it happen organically in your normal course of flying and move to the next level when and if it seems appropriate. BTW – love the new theme, it rocks! Thanks for the kudos on the new design! It’s a bummer that your wife doesn’t like to fly. Of course, that factoid might work to your advantage in the sense of never having to trade legs, share the controls, or worry about yanking & banking. Even if your dad wasn’t able to get his certificate, I’d bet the flying experience you two shared was pretty unforgettable! I think it would depend on how things went when you’ve taught her something in the past. How “bad” did those go from both of your perspectives? One thing I’ve learned from teaching my wife various things is there’s that extra pressure to succeed that you impose in yourself. You want her to succeed, so you with extra hard to get her there. She feels the pressure to succeed because it’s you teaching her. It can become this vicious cycle really fast. Then when failure comes it’s not like you can both go you’re separate ways to try again another day. You both head home, you put on your “sounding board” hat; but, to her, you are still both sounding board and instructor. Good point, Keith. A vicious cycle is exactly the kind of thing I want to avoid. My primary goal is to ensure her flying experiences are positive and leave her wanting more. I’m fortunate to have a spouse who enjoys flying! If flying in a dual control plane on a regular basis with a partner – I think it foolish not to give them at least some “pinch hitting” skills to have a chance of saving their own skin in the event you expire while aloft. To that end I got my significant other to the point she could take off, change altitude and heading and get into the pattern with some elementary radio work to ask for help. We developed a “passenger has to land the plane” checklist which after a lot of working through we got down to the absolute bare essentials of what it would take to ask for help to get to a big runway and put the plane down in some semblance of a landing that could be walked away from. But we got stuck on final. No way, no how was she going to take it from the base to final turn to the pavement with me coaching her – and that speaks to your “Is the $6,000 savings worth it?” In the end I spent about $400. We booked a weekend away at a school with an instructor each for an immersion weekend. Me to get a taildragger endorsement. My partner to fly with a sympathetic, female and nearer her age CFI to get the plane on the ground. Some Redbird Sim time and then 18 full stop landings in the pattern with that CFI in our plane and my partner “got it”. Not to the point she can tackle anything – but to the point that from the right seat she can get the plane over a wide runway with a minimal crosswind component and get the plane down in one piece. She came away from the weekend with a new and huge confidence in her flying after discovering from the CFI that I had not been lying about her quite reasonable day VFR skills. She is still not wild about landing the plane but she has gravitated to the left seat which she quite likes and she smiles a lot more when flying. When I was an active instructor a few decades ago, I was teaching my kids to fly, and was looking forward to soloing them. You and I know that the cockpit of a C150 is very noisy, and it is necessary to raise your voice to be heard over the sound of the engine. It was time for that with my oldest, and I told him before the flight to wear something old. because we were getting close to that point. What a surprise I got during this final “check ride” to solo, when my oldest kid reponded with “Stop yelling at me!” I knew right then that the emotional tie was getting in the way of instruction — and learning. So we landed, and I immediatly walked us up to another instructor I trusted and asked him to check out my son for solo. He passed it easily. On the one hand, I was disappointed in not being the one to solo my son. But on the otherhand, It was, I believe, a wise and loving move — to know when personal relations are too close for an instructor discipline to be effective. I would give my right arm if my wife would fly with me at all. I got my VFR License late in life (Age 70). I will be 73 this Nov. & have about 230 hrs as PIC. I can only afford to rent. Several friends from my church have gone on $100 hamburger flights with me & my son flew with me on a two day cross country. How awesome you two enjoying flying… GOD Bless… Stan Hill… San Antonio, TX. My husband and I are both pilots. I was his instructor for both the multi and multi-instructor certificates. We separated personal from business, and we did just fine together. Making it trickier, it’s the wife teaching the husband. Trickier yet? The husband had started off as a more experienced pilot than the wife. Over time he cut back and I did more, and in the end I was the one who needed to be the instructor for those two tickets. And our marriage was never in any doubt. We actually had fun with it, and mutual respect, and a clear definition of boundaries. So I wouldn’t discount the idea, but I would say it depends on the ability of both parties to separate flight training from personal to a degree. Remember the airplane does know if it has a male or female behind the controls, there is more than one way to do something. I will admit he has been fflying longer and I have learned a lot from him, for which I say thank you. Many Women Pilots friends of mine have received their primary, instrument, multi, SES from him all successful. Come to think of it he taught me – Commercial Glider and we did make it. Uhm, well, I taught my first ex-wife to drive and I taught my second ex-wife to sail. And I was patient, understanding and sensitive. My father taught me to fly and I hated him until the day he died, well, maybe a little longer. I not only taught my wife to fly, I took her through her instrument rating, and finished off her preparation for Commercial after a brief, forced hiatus from training. We split up 10 years later, but that had nothing to do with anything that happened in the cockpit. Our success was facilitated by the fact that our original connection began with a student-teacher relationship: I was her high school English teacher; we married shortly after meeting up again at her 10-year high school class reunion. Obviously, that’s a special situation, but I think there is much in my experience that would be useful. One of the things you missed in the argument FOR: Flight instructors fall in love with pretty ladies. Sexist? Perhaps. But a fact of life, nevertheless. Having seen a photograph of your wife, I’d say you are in the same boat I was in. Once an instructor falls for his student, he is no longer useful as an objective witness. He cannot see her with a clear set of eyes. There’s a good chance that anyone you send her to will fall head-over-heals into uselessness. On the other hand, you’ve been with your wife long enough to have a balanced view (maybe you do; maybe you don’t; but you’ve been in the relationship long enough–that’s all I’m saying). You very well may be able to balance your love for her with your professional drive to adhere to a set of standards. I wouldn’t necessarily discount the possibility. The main reason I did my wife’s instrument rating was that the instructor that I referred her to lost his objectivity. He saw her in a “glow” without seeing the flaws in her technique and organization. I ended up firing him, and doing it myself. I was a hard task master, but I believe that she was better for it. Why was I hard? Because I loved her, and I wanted her to stay alive. (1) Agree when to “turn it on and turn it off.” Be sensitive to “mission creep”–where you begin to instruct in areas, or at times, where you have no business instructing. If you have good communication, the two of you can discuss this, and check each other, without becoming defensive. (3) Never introduce “just one more thing” in a lesson with your spouse (because she’s so extraordinary) that you wouldn’t do for anyone else. (4) Adhere to the standards. (5) When you must exercise discipline, make it clear that this is done to keep her alive, not as a needless exercise of power. Remember that your spouse is vulnerable to all the same pitfalls as anyone else who tried to learn how to fly–including you. She will bring to the airplane everything that terrifies her in life, just like you did and just like everyone else does. This could be a real opportunity for you both. It has as much potential to bring you together as it does to tear you apart. With any luck, you’ll learn as much about your own weaknesses as she learns about hers. And with any luck you’ll both learn to forgive yourselves…and each other. And isn’t that what marriage is all about? The question I would first ask is ” Have you ever commented about her driving a car and what was her reaction”? I never taught a spouse to fly, but have taught a spouse and others to drive a car. The others were easy, the spouse was not at all. As previously recommended, you’ll have to separate business from personal. Very difficult to do. You need to examine what kind of relationship you and your wife have before you complicate it with being her flying instructor. She also needs to be honest with how she responds to people shouting at her in a noisy environment. 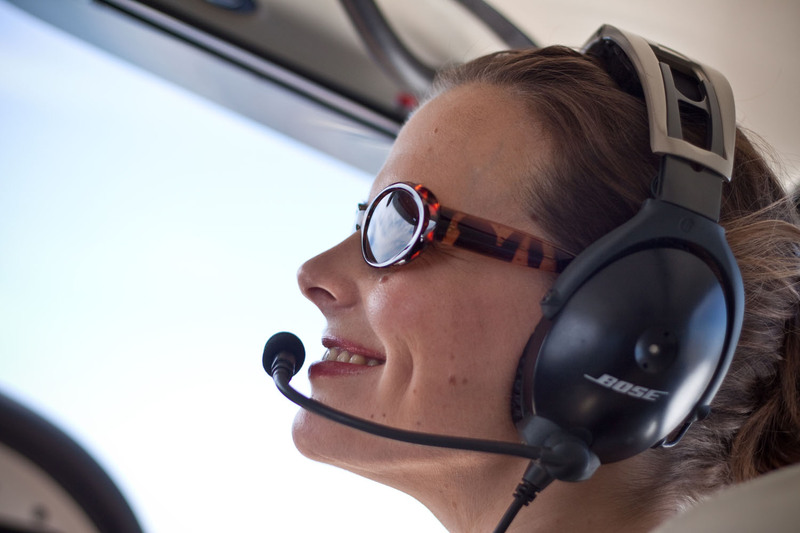 I learned to fly with a female instructor over 35 years ago because I know I tend to ignore what men tell me to do. Once I was comfortable as a private pilot, then I could handle a very laid back male instrument instructor. Then, 30 years ago I met the man that would become my husband after we dated 14 years. I found him at the airport; he fixed the planes I flew. He guided me through the purchase of my first plane, but the catch was it was a taildragger and I was a nose-wheel pilot. He did an excellent job of instructing, although his voice was difficult to deal with in the plane because he always sounded so “mad.” What always puzzled me was that when I heard him on the radio from another plane he sounded so “cool and calm.” Fortunately, he quickly checked me out in taildraggers and we had many years of flying together. Only once did he tell me to “shut up!” It was justified at the time because we were dealing with a narrow runway and a 45 kts crosswind. I only laid down the law once as to who was flying my plane when he grabbed the controls unexpectedly. He mentored me through building my own homebuilt airplane and took great delight in recording my test flights. The video shows that he told me what to do the whole time from the ground, even though there was no radio communications. He never could be quiet, he had been an instructor for too many years and he couldn’t help himself. In my Cessna 120 I discovered the intercom was a great blessing. I could flip the switch and have some peace and quiet for a while. He taught me how to handle the plane well. At one uncontrolled airport I did not have the intercom on and had a really perfect approach and landing, only realizing as we were rolling down the runway that he had to be talking because his hands were very animated. As I flipped the switch back on he said, “you followed my directions so well, it was a perfect landing.” He seemed a bit upset when I told him I didn’t hear a thing. But you know, when I fly every time I land I can still hear him in my head saying “keep it off, keep it off,” his mantra for a perfect three-point landing. He died a year ago. I sure miss him in the airplane. I think it’s a wonderful idea and can work to your benefit. As someone who went through three other instructors (wrote about my frustrating flight training process here: http://www.joeburlas.com/2012/12/im-private-pilot.html …) before finding the one that worked well enough to ‘take me all the way’, I can honestly say that if I don’t have both a professional and personal relationship with my instructor it just doesn’t work for me. I need to know that I can be comfortable enough to laugh off a mistake while still maintaining the seriousness needed to understand the real responsibility that resides with becoming a Pilot in Command. The last instructor I had before I started working for Leif was a real good pilot and someone who was very knowledgeable but when you made a mistake you could just see the frustration and disappointment coming from him. It wasn’t until I started flying with Leif, who is now one of my better friends and an aviation shoulder to lean on, that I really became motivated at wanting to make my instructor ‘proud’ of me. I’d say go for it. If you all have good communication anyway — this will help the process. You too look very happy together and as long as you establish boundaries right away, I see no real problems. I’ve talked more about girls and relationship issues ‘in the cruise’ than I ever have on the ground. It’s a relief in between stressful maneuvers and comforting to know that he took a personal interest in not only my flight progression, but me as a person. Hope this helps. Just a thought, from another CFII, My wife although not enamored with the idea of flight, goes when it is faster and more convient. Normally I show her a few things as we proceed cross-country. But mainly she wants to know what to do in an emergency. For her and maybe your wife, I might suggest periodic “stage” checks from another instructor. Another insight into her skills and additional input could go a long way to smoothing out the wrinkles. So keep it fun, safe and educational. Totally “on target” Mike. Stage checks are required for Part 141 training, and for good reason: No one knows everything. I might say something a hundred times, and someone else will say it in a slightly different way…et voila!…it clicks. Anyone teaching under Part 61 should regularly have a trusted CFI check the progress of his/her students. Excellent article, Ron. My wife enjoys flying with me, so she decided to try lessons. She’s had 10 lessons from 3 different CFIs. The first never briefed and acted like he wasn’t really interested. The second was an older instructor that acted like a drill sergeant (after always being a good 45 minutes late — with no apology — once airborne he’d tap the altimeter if she was off altitude by 10 feet!) The third insisted she fly an approach speed 10 knots faster than the POH, while always jerking the power to idle crossing the threshhold (the airplane didn’t, naturally, want to land 10 knots “hot.”) She became very frustrated and discouraged. I’ve got a military and part 121 instructor background but no single engine CFI, so can’t be her CFI of record. She says she’d enjoy it if I’d be her instructor. I offered to do what ever it takes to jump through the CFI hoops, but, she’s lost her drive to solo (the third guy said she was SO close to solo, then gave up on her when she didn’t meet his timetable.) So, can you teach your own spouse … absolutely! … likely with more professionalism and attention to the POH than the type of CFIs we’ve (unfortunately) come across. I thought “anyone other than me” would be best … I don’t have that conviction now. She keeps up with the weather, has passed her written, and can make our aviation apps “sing” on the ipad — she’s great to have along. None of the aforementioned CFIs ever tried to encourage and motivate — or call to ask why she stopped their services. A spouse CFI can encourage and motivate his/her spouse student-pilot far better than a “stranger” CFI. I am one of those blessed wives with a husband who is a CFII, ATP and all-around-aviation-hero-of-my-dreams….and I just got my private ticket this last mother’s day. 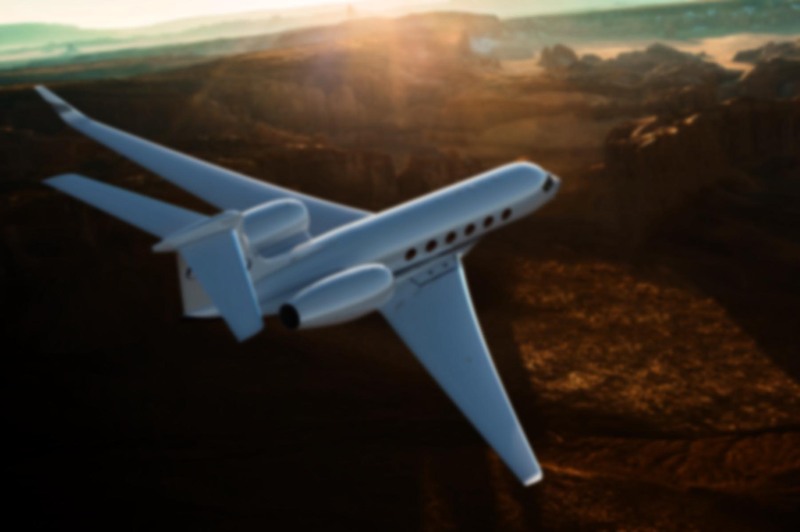 Like you and Kristi, my husband opted to give me initial training on a low-key, intermittent basis–probably smart, because it only made the desire to fly and learn more all the stronger. As the “flying bug” became a fever, it made more sense to fly 2-3 times a week with the instructor at the local FBO, mainly because my husband’s work schedule wouldn’t allow for that. Advice to the spouses and significant others? Learn by having an open mind, listen and do what your instructor (whatever their relationship may be) is telling you. The down side of having another instructor besides the hubby is that I experienced two different philosophies, if you will, of schooling–that was okay for me–but sometimes made it difficult for one instructor to agree with the other. The upside? My husband and I share a unique joy most cannot understand, plus we are the only couple I know who will stay up till 2 a.m. discussing VOR nav. or watching airplane videos on YouTube! Enjoyed the story, comments and controversy. I am a CFI, taught many students thru various ratings, have a family of 5 daughters with one wife…taught my wife to fly because she said flying made her airsick and after she was ‘in control’ never got sick again. One of my daughters was flying aircraft all over the country before she had her driver’s license…she is now an aero engineer and I soloed her on her 16th birthday. Two other daughters also earned their private licenses under my guidance…one went on to her multi and commercial ratings at Embry Riddle. I preferred to instruct them all myself thru their private tickets because I wanted each to have solid foundations and know what those building blocks were instead of turning them over to someone with unknown experience and training regimens. They all are qualified in tailwheel aircraft, fly my Stearman and T-6. Its been very rewarding and when I fly with them they are ‘chips off the block’, especially their consistency in skill and good judgment…two of the most important aspects of safe flying. I found that teaching my family members to be no different than instructing anyone else and would encourage others to do the same. Have fun always, quit if it is not…..
One of the first things I did after getting my pilot’s certificate was, for two reasons, teach my wife to fly: initially because flying is just to much fun to keep to myself [I had to share the wonderful joy and challenges with my best friend]; and secondarily we both enjoy having a backup machine operator in the cockpit. I found a third bonus reason by teaching her, that being I found that my own knowledge and skill set was reinforced. I am the wife of a husband who always wanted to fly – so I bought the orientation flight and have supported the many hours and cost for him to get his license. I love going on the trips with him, talking about where we will go and what we will see. I can follow the charts and keep track of our location, in fact I enjoy having this role on our trips. But I think one of the most important comments made is that people learn at different levels. I have watched while he does the flight plan, asked him to explain – he goes too fast, there is more happening in his head then he is explaining to me. Was I nervous on our first couple of flights – you bet. This is his passion, mine are different. I enjoy our trips and if I need to learn how to put it down for safety sake okay. But do I really need to learn to fly because he does? I don’t think so, and yes he does ‘help’ me drive, so no he would not be the person I would choose as an instructor.